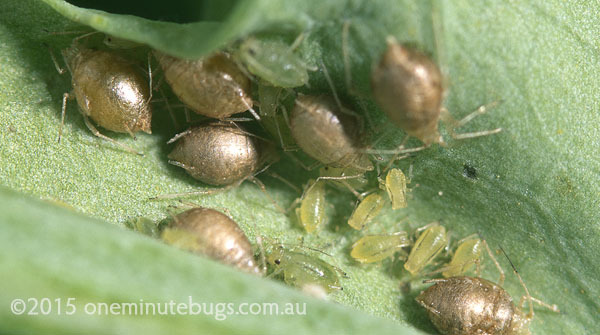 Have you noticed swollen bronze-coloured aphids on your plants? 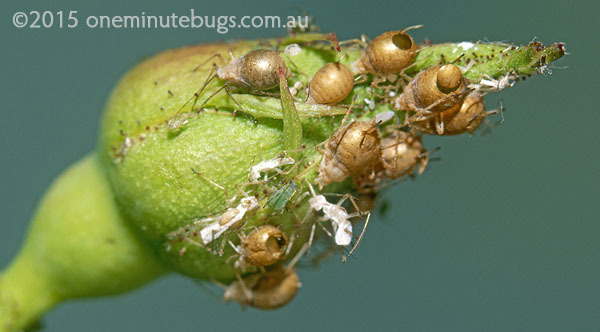 These are aphid ‘mummies’ caused by the parasitic wasp Aphidius of the wasp family Braconidae. There are several species of Aphidius which have been released in Australia. A species that has established well and is common in urban gardens is Aphidius rosae, a successful parasite of the rose aphid Macrosiphum rosae. Aphidius wasps are shiny black, slender insects about 3 mm in length with long antennae. The diminutive size of these wasps makes it hard to see them in gardens, but you will see the results of their life cycle within aphids. Adult female wasps lay their eggs singly inside adult aphids and aphid nymphs. To accomplish this a female wasp must bend her abdomen under her legs and inject an egg into the aphid with her ovipositor (‘stinger’). If you were watching and you blinked, you would miss it, as this operation takes less than a second. Obviously I don’t have many images like this one. The wasp egg hatches into a larva inside the aphid and the larva eats the aphid from the inside. The larva eventually pupates which causes the aphid to swell and develop a crusty bronze shell i.e. it becomes an “aphid mummy”. The aphid is now dead and the wasp pupa develops into a fully formed adult wasp inside the mummy. When the wasp inside is ready to come out, she or he chews a neat round hole in the aphid mummy and emerges to look for food and a mate (not necessarily in that order). Adult wasps feed on nectar and honeydew* from aphids. 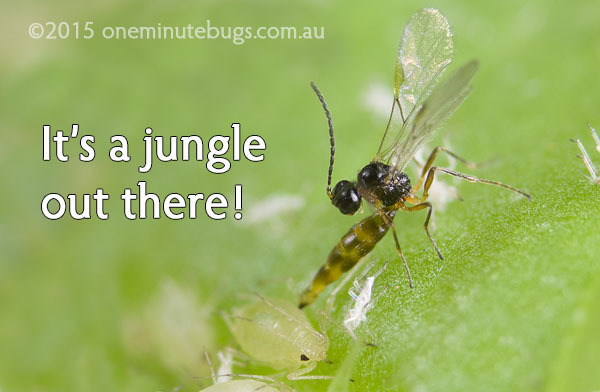 Once they have fed and mated, female wasps hunt for aphids to lay eggs in, and the whole cycle starts again. Aphidius can develop from an egg to an adult wasp in as little as 10 days depending on the temperature. Aphidius wasps are important parasites of aphids, but this “good bug” is only one in the armoury of beneficial insects which help control aphids. For example, there are other types of parasitic wasps (Aphelinus spp.) which cause aphids to turn into black mummies – then there are predators like ladybirds and lacewings. It is worth noting that chemical spraying will kill these helpful insects as effectively as it kills aphids, so it is important to minimise the use of pesticides as much as possible. *Honeydew. How best to explain that? No, it’s not a type of melon. It is excess plant sap which is excreted (and in some cases ejected) out of the rear ends of aphids and many other sap-sucking insects. It’s really sweet and sticky and if it falls on plant leaves and twigs it may promote the growth of sooty mould. What does that mean? If you have sooty mould on your plants it means you have a pest problem – not a disease problem. Capiche? This entry was posted in parasite, wasp and tagged aphid, beneficial, parasite, wasp by denisjc. Bookmark the permalink.